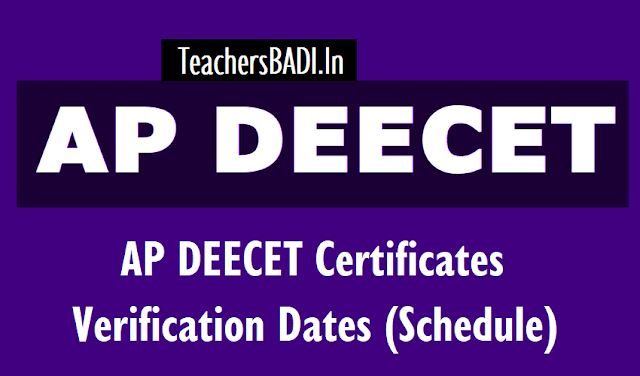 AP DEECET 2019, Instructions and guidelines are provided here on the certain items for AP DEECET 2019 verification of certificates: Director of School Education and Director of School Education, AP state has given the AP DEECET 2019 Certificate verification Dates for Generation of Final Admission Letter and DSE AP invites DEECET Qualified and Provisional Admission Letter Downloaded candidate for certificate verification and these verification dates are announced. All the DEECET 2019 candidates are here by informed that it is decided to verify all the original certificates of DEECET-2019 qualified candidates before download or generation of Final Admission Letter for joining in D.Ed Colleges with this. Hence all the students (qualified) are requested to attend the Government DIET College of the concerned District from where they appeared for DEECET 2019 Exam with all original certificates. Certain Items for Verification of certificates:The following instructions are issued for verification of certificates of candidates appeared for DEECET-2019. I. The candidate who passed or appeared for the 10+2 Examinations (qualifying examination) or its equivalent are eligible to appear for the entrance test. But they should have passed the qualifying examination by the time of admission. II. The OC candidate should have secured 45% of marks in aggregate in qualifying examination. The BC candidate and PHC Candidate should have secured 35% of marks in aggregate in qualifying examination. The minimum percentage of marks in the case of Scheduled Caste, Scheduled Tribe and Physically Challenged candidates shall however be 30%. III. Rajive IIIT and Intermediate pass from AP Open Schools and National Open School candidates are eligible. IV. Urdu Fasil, Vocational and Bridge course certificate holders are not eligible. The candidates who studied Telugu or Urdu as first language in SSC or its equivalent or who studied as one of the above languages in part II in Intermediate exam are alone eligible for admission of seats into concerned medium viz. Telugu/Urdu offered by the Institution concerned. The Candidates who availed fee reimbursement for Professional studies are not eligible for reimbursement. Integrated caste certificate issued by Tahsildar is only to be accepted. CAP certificates should be verified by the District Sainik Welfare Officer. They are requested to collect the CAP certificates from the candidates called for verification on all dates and depute one responsible person to the District Sainik Welfare Officer of the of their concerned districts for verification and obtain genuine’s of the certificate. If it is found not eligible the same may be brought to the notice of the Convenor.